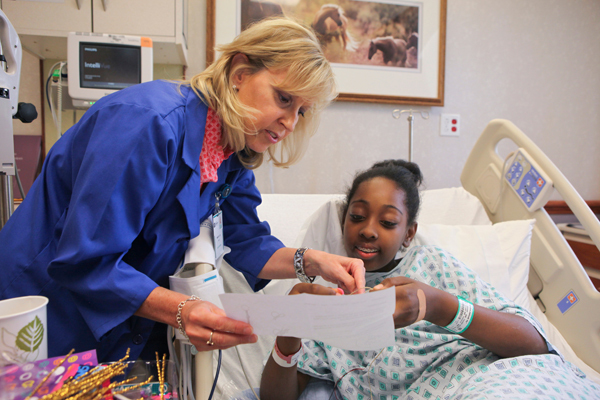 Hospitality volunteer Mary Jo Atz helps a young patient make a bracelet. Akron Children’s Hospital Mahoning Valley has added a new position to its list of volunteer opportunities. Hospitality volunteers are now visiting patient families on the Beeghly campus. The position was recommended by the hospital’s Parent Advisory Council (PAC), parent volunteers who work with Akron Children’s to enhance its philosophy of patient and family-centered care. 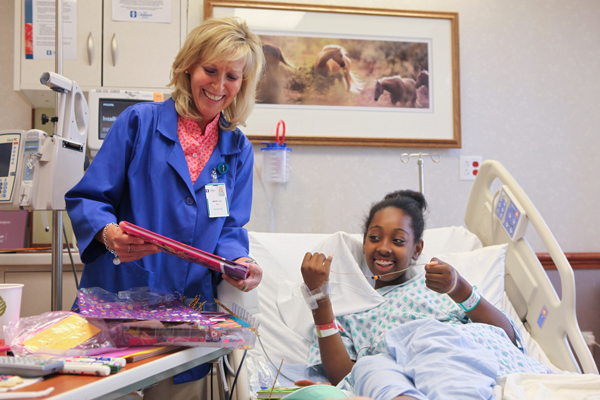 Hospitality volunteers provides a link between staff and patient families. They give parents a break from the bedside, allowing parents to rest, run an errand or get something to eat. They also assist by playing games, activities, sitting or walking with the patient. “In addition to going room to room to provide respite for families, these volunteers might refill water pitchers or feed a baby while a nurse charts, alleviating some of the stress on the clinical staff but still meeting the needs of the patient families,” said DeAnne Bunevich, a child life specialist who works directly with the volunteers. Currently hospitality volunteers include Mary Jo Atz, Barb Bletzer and Lisa Lane. They provide services in the afternoons on the pediatric unit, but there are plans to expand their services to other areas and other times of day. Sue Heher, supervisor of Volunteer Services at the Beeghly campus, also sees the benefit. Learn how to become a volunteer or let us know how a volunteer has touched your life.